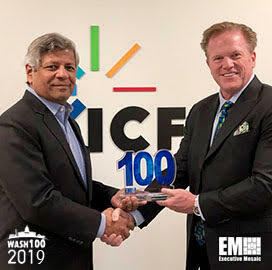 Jim Garrettson, founder and CEO of Executive Mosaic, presented Sudhakar Kesavan, chairman and chief executive officer of ICF, with his second Wash100 Award on Tuesday. Executive Mosaic recognizes Kesavan for leading the company to great financial success and multiple contract awards in 2018. We are honored to present the most coveted award in government contracting to Sudhakar Kesavan of ICF. Kesavan joined ICF as an associate in 1983. He was named president of ICF Consulting Group in 1996 and became the chairman and CEO in 1999. Kesavan has also led the expansion of ICF’s geographic footprint globally. To date, the firm has established offices across the U.S., Canada, United Kingdom, Belgium and India. In addition, Kesavan serves as a board member emeritus for the Northern Virginia Technology Council and the Rainforest Alliance. He support IIMPAT, a non-profit organization focusing on primary education for young girls from economically and socially challenging areas of India. He is also a member of the board of directors of ABM Industries and the board of trustees for Inova Health Systems. Kesavan earned his bachelor of technology in Chemical Engineering from the Indian Institute of Technology, a post graduate diploma in Management from the Indian Institute of Management, Ahmedabad and a master of science in Technology and Policy Program from the Massachusetts Institute of Technology.